Metalloprotease that specifically cleaves 'Lys-63'-linked polyubiquitin chains. 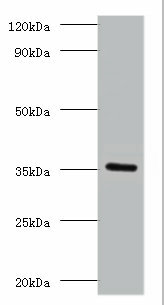 Does not have activity toward 'Lys-48'-linked polyubiquitin chains. Component of the BRCA1-A complex, a complex that specifically recognizes 'Lys-63'-linked ubiquitinated histones H2A and H2AX at DNA lesions sites, leading to target the BRCA1-BARD1 heterodimer to sites of DNA damage at double-strand breaks (DSBs). 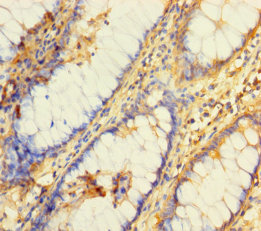 In the BRCA1-A complex, it specifically removes 'Lys-63'-linked ubiquitin on histones H2A and H2AX, antagonizing the RNF8-dependent ubiquitination at double-strand breaks (DSBs). Catalytic subunit of the BRISC complex, a multiprotein complex that specifically cleaves 'Lys-63'-linked ubiquitin in various substrates. Mediates the specific 'Lys-63'-specific deubiquitination associated with the COP9 signalosome complex (CSN), via the interaction of the BRISC complex with the CSN complex. 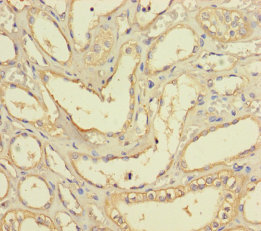 BRCC3 Polyclonal Antibody. Unconjugated. Raised in: Rabbit.